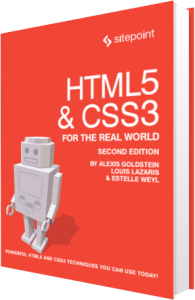 Weâ€™ve coded most of the page, and you now know almost all of what there is to know about new HTML5 elements and their semantics. But before we start work on the look of the siteâ€”which we do in Chapter 7â€”weâ€™ll take a quick detour away from The HTML5 Heraldâ€™s front page to look at the sign-up page. This will illustrate what HTML5 has to offer in terms of web forms. Forms are often the last thing developers include in their pagesâ€”many developers find forms just plain boring. The good news is HTML5 injects a little bit more joy into coding forms. By the end of this chapter, we hope youâ€™ll look forward to employing form elements as appropriate in your markup. This sample registration form uses form elements that have been available since the earliest versions of HTML. This form provides clues to users about what type of data is expected in each field via the label and p elements, so even your users on Netscape 4.7 and IE5 (kidding!) can understand the form. It works, but it can certainly be improved upon. Weâ€™ll cover all the newly added input types later in the chapter. Before we do that, letâ€™s look at the new form attributes HTML5 provides.